BTXpress Cytoporation® Low Conductivity Medium T is designed with the BTX AgilePulse MAX Large Volume Electroporation System for ex vivo or in vitro delivery of DNA, RNA, oligonucleotides, and siRNA. The low conductivity buffer is specially-formulated to minimize heating of solution during large volumes electroporation for maximum transfection efficiency and high cell viability. 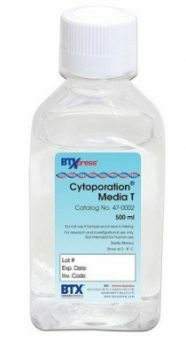 BTXpress Cytoporation Media T is sterile-filtered from the highest quality non-animal, medical-grade reagents. Two formulations with different conductivities are available for optimum conductivity for each eukaryotic cell types. Buffer can be directly diluted in complete growth media for post-electroporation cell culture.